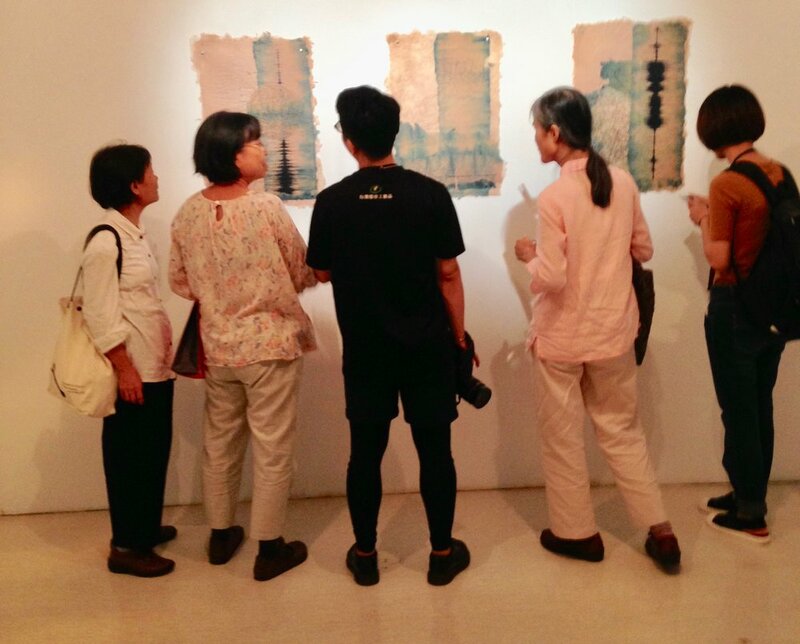 I was thrilled to be one of three artists selected to present at the Eco-Sublime-Biennial International Paper Fibre Art 2107/18 at the National Taiwan Craft Research and Development Institute, Caotun, Taiwan. which is on until March 2018. It's nearly two weeks since I returned from this adventure and already some memories are fading, so I want to write up my experiences while they are still fresh in my mind. The exhibition is installed on two floors at the Craft Design Hall, beautifully lit and with attention to details such as space, lighting and relational compatibility of artworks. These ranged from suspended paper casts of a motor scooter and a paper dinner setting, to knotted cotton ‘ghost nets’, meteoric rocks and paper fibre tree seedlings. The event was coordinated by Jan Fairbairn Edwards from the Association Chaine de Papier in conjunction with the NTCRI with support from IAPMA. Highlights: meeting so many interesting artists from all around the world and sharing ideas, a tour through the NTCRI craft studios seeing the wonderfully aesthetic organisation with ceramic indigo dye pots, ergonomic washout troughs and brushes hanging from the wall and most importantly for me, gaining confidence from presenting my banana paper to a discerning audience of artists and craft masters. Weather: it was hot, very hot which meant we spent a fair amount of time in the air-conditioning of the craft hall or in the accomodation at the NTCRI. Short visits were arranged for us to visit the paper factory at Pulli, some temples, the Paper Dome, the Sun Moon Lake as well as partaking in traditional Taiwanese banquets for all of the visiting artists. 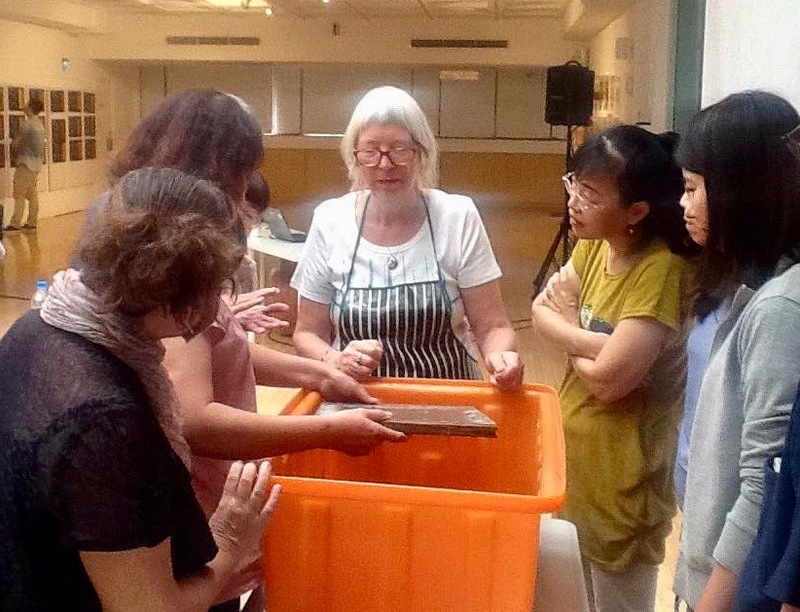 Workshops: I was also invited to hold a three day banana paper making workshop with graduate students at the University of Tainan School of Arts. This was a delightful experience and I learnt so much from watching the students experiment with banana fibre as a material not just for making paper. It was bit daunting working with an unfamiliar Hollander beater but the students quite happily took it apart and put it back together again four times so that it was cleaned and working properly.